The popular games developer, Plarium, is back once again with a brand-new MMO strategy game called Throne: Kingdoms at War. Unlike the others under their umbrella of strategy games, this game assimilates all the best features of their previous games while adding in a few significant aspects of its own, giving its players a rather unique experience. 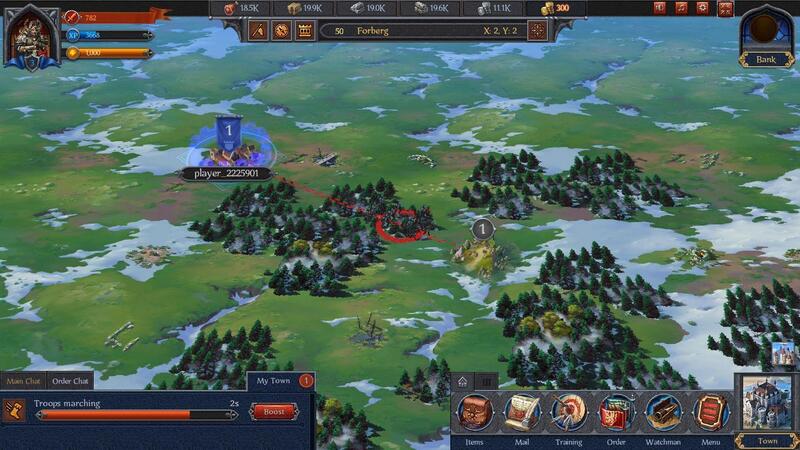 Similar to most strategy games, resources are the cornerstone of a thriving and strong kingdom. Thus, it’s not surprising that the game’s tutorial starts you off by constructing a couple of resource-producing buildings, such as the farm, lumber mill, mine and stone quarry. You can build multiple of these buildings to increase the resource you get, but you mustn’t forget to upgrade these structures too. Considering that you’ll need resource for almost anything in this game, it’s nice that the game provides you with alternative methods of getting yourself some extra resources. You can complete Errands to get some, or you can even simply complete quests, which are basically a guide of sorts to help you to develop your kingdom and your army. Once you’ve unlocked the Port, you can also trade resources that you have in excess for resources that you lack. The best part though is that the upgrading process is made simple in this game. Instead of manually finding and upgrading all the prerequisite buildings prior to improving the building you need, the “Go To” button will helpfully direct you to all the prerequisite buildings, cutting down the time you need to mouse around. Not to mention, any building or upgrade duration that’s less than 6 minutes can be sped up for free. If the duration is much longer, there are plenty of free speed-ups given to you so you can dash through the earlier upgrades and level up faster. Now that your kingdom is well taken care of, it’s time to start building up your army. There are many different types of troops you can recruit, though each of them are grouped based on tiers rather than their unit type. This means that you won’t be able to recruit different units at the same time since it’s likely the units you want to recruit are from the same tier. The combat, on the other hand, is pretty much the same fare as the other Plarium games. 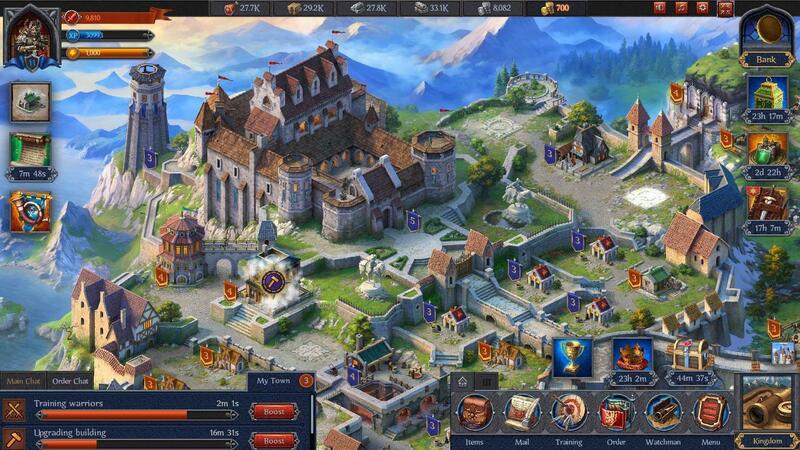 The battles are all auto-resolved and usually, the player with the strongest and highest number of troops will win. This also means that you’ll need to spend some of your valuable resources to upgrade your troops by taking up Military Studies at the Academy. There are plenty of other studies you can learn here, but due to the limited resources, you might want to focus on certain studies first. Aside from troops, you will also have a hero. The hero can be equipped with gear crafted and/or upgraded from the workshop. He will even have skill trees of his own, giving you permanent bonuses to either your military or economy when skill points are invested into these respective branches. The map you’ll be doing most of your conquests on is rather special as well. It is scattered with many resource locations that you can capture, roaming bands of Assailants that your hero can challenge, as well as other players’ kingdoms that you can invade. However, if PvP is something you like, then you might want to join an Order first before taking on stronger players. After all, the task of conquering and dominating the map won’t be as difficult if you have some strong, trusty allies by your side. If you’re looking to get a leg up, you can also spend some real money to buy gold (premium currency) just so you can purchase additional resources, military or economic advantages, invulnerability shields and more, or any of the game’s attractive packages which include free troops, boosts and more. 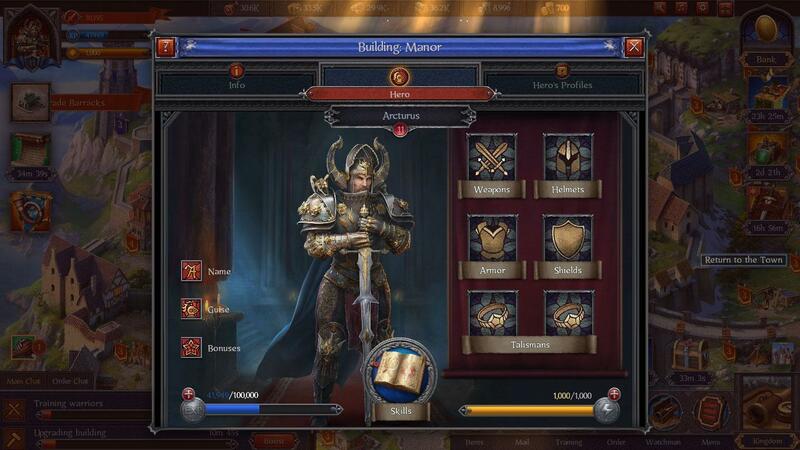 Similar to most Plarium games, Throne: Kingdoms at War has excellent graphics, sound effects and background music, creating the perfect ambiance for strategic gaming. In short, Throne: Kingdoms at War is able to provide a gaming experience that’s rather unique even for avid players of the other Plarium games, in spite of the somewhat generic theme. So, if you are interested to once again show the might of your kingdom as you conquer the land, then don’t wait – start playing Throne: Kingdoms at War now!